This will be a great course, and a great experience. You will see. . . . I am looking forward to meeting you in person . . . . In the meantime, you might want to have a look at the information in your folder, or the companion on-line web site . . . Right off the bat you might also be interested in the textbook for the course. Information on the textbook can be found at <http://www.d.umn.edu/cla/faculty/troufs/anth1602/pctext.html#title>. Understanding Humans, 11th Ed. is currently available online from about $89.55 new, with an Amazon.com "Buyback Price" of $52.53. (+ p/h, at amazon.com & eligible for FREE Super Saver Shipping on orders over $25). The Amazon Book Trade-In Program will buy it back (the current Amazon Buyback price is $52.53 (in the form of a gift card), which means the Amazon Price After Buyback would be $37.02 --a real bargain, even with p/h added). (19 August 2012) Amazon.com also currently is has another special offer available for MP3 credit. Other on-line and brick and mortar stores should have comparable offers. More information on the text is available on the course text WebPage at <http://www.d.umn.edu/cla/faculty/troufs/anth1602/pctext.html#title>. Thousands of other books are available free online, full text versions <http://www.d.umn.edu/cla/faculty/troufs/reference/books.html#title>, and might occasionally be useful in one or more of your other courses. And more information on textbooks in general can be found at <http://www.d.umn.edu/cla/faculty/troufs/tr/trtextbooks.html#title>. One of the four main characteristics of American Anthropology is fieldwork, "a primary research technique, involving “participant observation," which usually means living among the people one is interested in learning from and about. It would be wonderful if for anthropology classes we could just rent a bus or charter a plane and fly off for a year or more to learn first-hand from the people themselves. Money, time, and practicality prohibit that, so the next best things--when it comes to studying anthropology--is going to places and viewing subjects by film. More information on Visual Anthropology is available on-line at <http://www.d.umn.edu/cla/faculty/troufs/anth1604/visual_anthropology.html#title>. Be sure to have a look at that. Detailed information on these sorts of activities will be provided as we go along, but you can have a preview look in your Moodle home anytime you like. You may find the names of some of the prehistoric people and places confusing at first—don't let that bother you. After about six weeks they will start sounding familiar to you. With all of the materials you will be expected to share your ideas and comments with others in the Class Forum and wikis. I'm looking forward to that. My office hours (and regular schedule information) can be found at your Moodle "Home" and on-line on the regular UMD WebSite at <http://www.d.umn.edu/cla/faculty/troufs/anth1602/pcoffice.html#title>. Finally, laptops are welcome in the classroom. Many find a laptop quite useful in following the lectures as all lectures are web supported. You can, for example, download all of the slide materials used in class. So once again, welcome to Prehistoric Cultures. This will be a great course, and a great experience. You will see. . . .
Have a great Labor Day . . . . If you have any questions right now, please do not hesitate to post them on the Moodle "Messenger" or e-mail troufs@d.umn.edu, or stop in before class at Cina 215 [map <http://www.d.umn.edu/~giscalab/images/campus_map.gif>]. P.S. If you are new to the world of "technology" don't worry too much about that. Things may not "work" for you at first, but hang in there and we'll help you along. 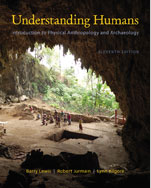 "UNDERSTANDING HUMANS: INTRODUCTION TO PHYSICAL ANTHROPOLOGY AND ARCHAEOLOGY shows students how anthropologists and archaeologists go about their work as they study human evolution, living nonhuman primates, human adaptation and variation, the origin and dispersal of modern humans, food production, the first civilizations of the Old and New Worlds, and so much more. 'At a Glance' sections and 'Focus Questions' help students better understand the material and study more effectively for exams." UNDERSTANDING HUMANS: INTRODUCTION TO PHYSICAL ANTHROPOLOGY AND ARCHAEOLOGY shows students how anthropologists and archaeologists go about their work as they study human evolution, living nonhuman primates, human adaptation and variation, the origin and dispersal of modern humans, food production, the first civilizations of the Old and New Worlds, and so much more. Using a biocultural approach, the text balances the presentation of physical anthropology with archaeology and concludes with a new chapter that ties together the material on human biological and cultural adaptation by focusing on lessons learned from our species evolution such as the impact of humans on the environment. Students will also benefit from the new chapter opening learning objectives, "At a Glance" sections that summarize key concepts, and end-of-chapter "Critical Thinking Questions" that help students better understand the material and study more effectively for exams. Now an Advantage book, this edition builds on the prior edition and is even more streamlined with 16 Chapters that now includes one succinct chapter on "The Rise of Civilizations" (Chapter 15) and a new "Conclusion" (Chapter 16). Fossils are presented in chronological order for easier student comprehension of the interpretation of human evolution. More examples throughout the text help students better understand the work of practicing physical anthropologists and archaeologists, including more material on the contributions of archaeology to the understanding of human evolution and adaptation. "Digging Deeper" boxes and "Cutting Edge Research" essays have now been moved to the companion website for more functionality, with key material being retained and integrated into the text. The book provides balanced coverage of physical anthropology and archaeology, including methods; human evolution; living nonhuman primates; human adaptation and variation; the origin and dispersal of modern humans; food production; and the first civilizations of the Old and New Worlds. The strong pedagogical program has been enhanced in this edition with re-drawn maps and line drawings, and superior new photographs while the "At A Glance" quick reviews, "Most Significant Fossils (or sites) Found in This Chapter," and the running glossary continue to help students better understand and focus on the key concepts. These resources are available to all students, faculty and staff -- both from on and off campus. If you are coming from off campus, you'll need to be either dialing in through the campus modem pool or fix your browser so that the UMD servers know you "belong" to UMD. You can go the class collection of UMD Library Resources On-Line, or you can go to the UMD library homepage and then click on How to Connect if you want to "tweek" your browser. Or, go to the UMD library homepage and then click on Electronic resources and then choose Indexes and Databases to connect to the myriad of databases available by subscription, as well as selected "free" sites.